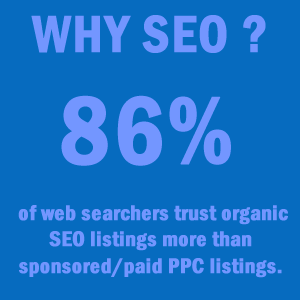 The better you do in Search Engine listings, the better you will do in business as more visitors will go to your website which means more clients and more sales. Search Engine Optimisation (SEO) is a term many people have heard but are not sure exactly what it means. The aim of optimising a website is so that when a potential customer searches for a particular word or phrase/s online, optimised website will appear above other websites in the natural listings of the main search engines. For example, the natural listings on Google are the sites listed on the left of the page below the paid advertising links. When optimising a website we start by running reports to identify relevant words or phrases, commonly known as keywords. These are the words or phrases which when a potential visitor to your website searches online, you will want your website to appear at the top of the listings. We then optimise your website based on the relevant keywords and on an ongoing basis, use a variety of methods to help your website achieve a high page ranking on the main search engines. Search Engine Optimisation will always be an ongoing process as the rules in which the search engines rank websites changes on a regular basis. In 2012, Google made over 500 algorithm changes – almost 1.5 per day! In addition to the search engines updating their algorithms, your competitors will be optimising their websites and you need to maintain and optimise your website to stay ahead. 91% of users say they find what they are looking for when using search engines. 73% of users stated that the information they found was trustworthy and accurate. 66% of users said that search engines are fair and provide unbiased information. 93% of online activities begin with a search engine. Over 100 billion global searches are made each month.